Hummingbirds are back in the neighborhood. If you want to attract them, you don’t need much. I attract mine in two different ways. 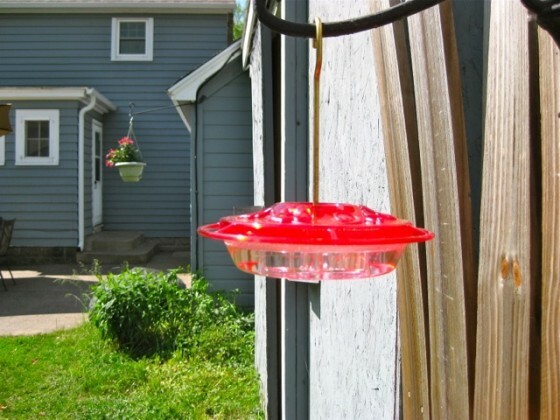 First, I have a hummingbird feeder. I recommend a flat feeder, much easier to clean than the traditional inverted bottle types. Place it in a shaded or partially shaded area. Fill it with nectar, a.k.a sugary water. Don’t bother buying what is marketed as hummingbird food. Just combine 1/4 cup sugar in 3/4 cup water. Bring to a boil. Let cool, and serve. You can make more at a time and keep it in the fridge for 10 days or so. My second method is to purchase flowers that attract hummingbirds. There are plenty to choose from. Red ones work best, but you can always mix in different colors too. This year I have annuals like salvias, fuschias, and petunias, as well as my perennial bee-balm that is always a hit in the summer. Here’s a video of a hummingbird at my window last year. My cat and daughter were particularly excited.